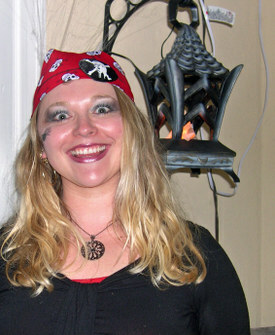 Charity's Crazy Beautiful Life: Ahoy there Matey, me hopes you had a Happy Halloween! 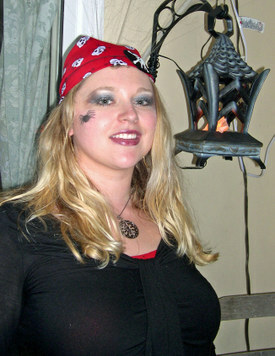 Ahoy there Matey, me hopes you had a Happy Halloween! Look closely at me boys. Some of you may recognize this costume from about five er so years ago. It was Daziels when he was this age. (Oooohhh, I love that! 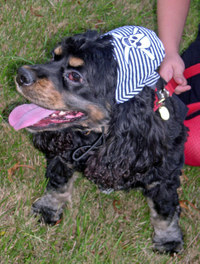 Ssshh, dont' tell Colby, Daz is a cuter pirate! ;-) And look at me handsomely devil of a husband. Look closer. He's wearing an earring. A real one. He let me put it on him...and he didn't realize it was real 'til the end of the night - first time I've EVER seen him wear an earring - he he. And you must take a look at some more pictures of me family. You see, me young lad Daziel was a fine part of me crew tonight. Such a handsome young lad is he. And he always looks so good in his Halloween Costumes. Makes me just want to squeeze him tight! 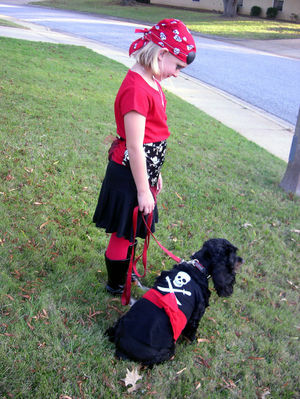 And the pretty pirate girl with her pretty pirate pup. 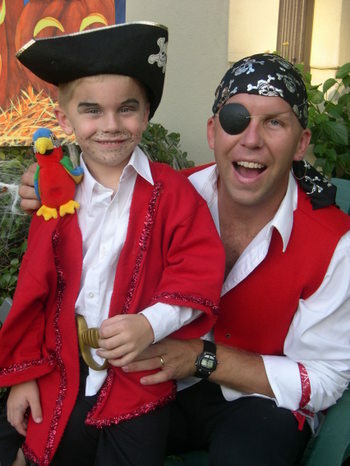 Yes, we even had to include Nicholas, our landlubber cocker, in the fun of our Halloween games. Aren't they just so adorable???? You can make fun of us all you want...but we Zaleski's know how to have some fun! And fun we did have! 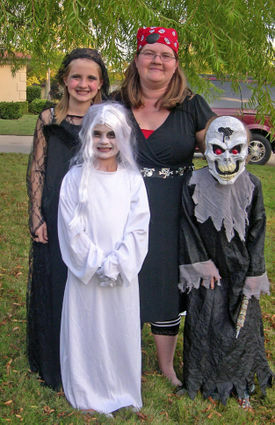 Me good friend Jamie and her kids came over tonight. 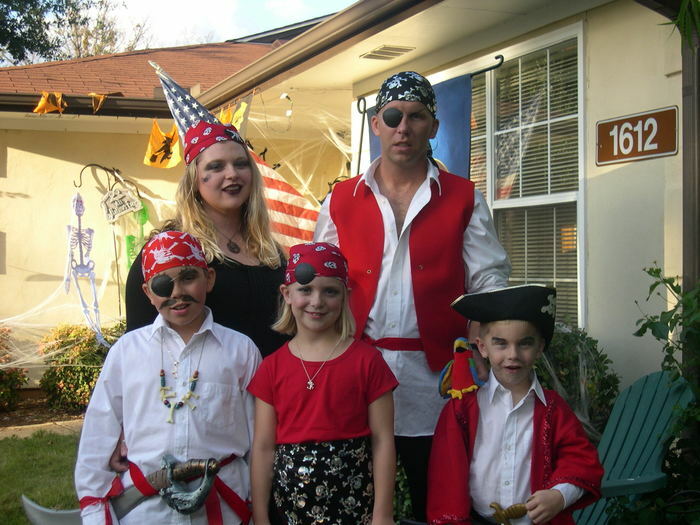 We all got ready and Craig took the kids out trick-or-treating and Jamie and I stayed home to pass out candy and cook up some good grub so the tired mates could eat when they came home with their bags of treasures. 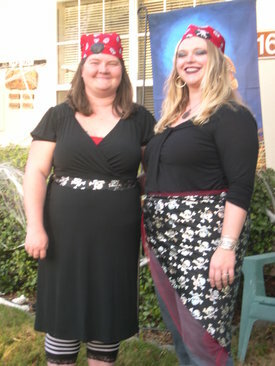 Me's friend Jamie decided to dress like a Pirate with us too. 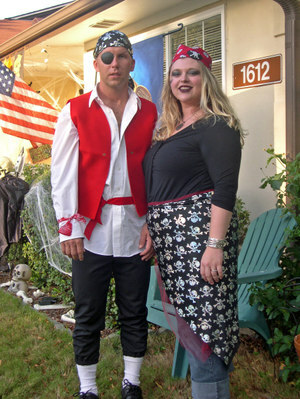 Her and I actually dressed like this at school (the kids' Elementary school) today to pass out their Candy Grams. Was alot of fun! Did I mention we Zaleski's know how to have fun? 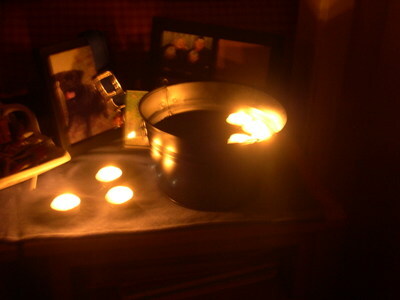 Craig downloaded some really cool, spooky music and hooked up his fog machine. 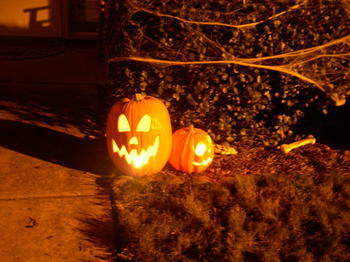 I had already decorated the front of the house weeks ago. It was a good night. 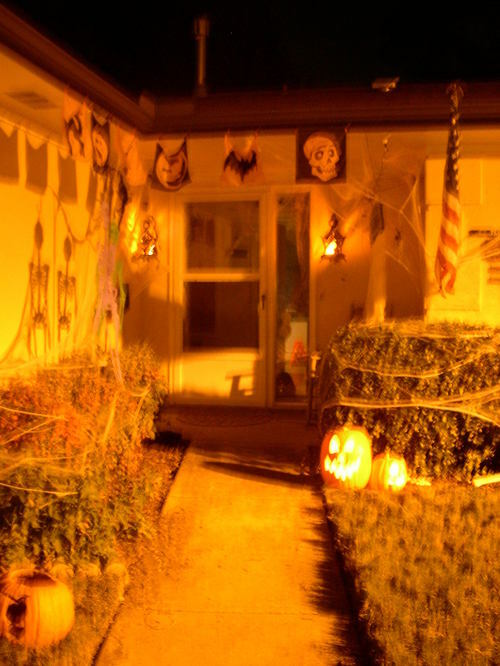 Everyone loved our house. The kids had a blast! And, Craig and I did too! He did a great job taking all six of the kids out. He even stayed in costume all night. (Me's thinks he likes wearing the outfit more than he's would like to admit ;-) A good Halloween! 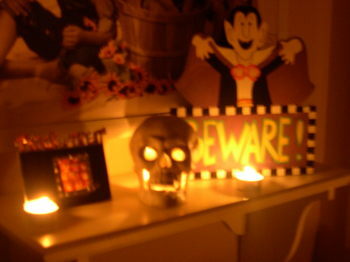 I LOVE HALLOWEEN!! I had a fun night! Me and me crew! Great costumes! Your so creative!! Love the pictures. Hope you all are doing well. Take care.